This just may be the best week of the year. Why? There are many things we can celebrate this week such as spring, puppies, basketball and happiness. Just check out all the things you can do to recognize and celebrate. Warning: adorable puppy dog photos are inside this post. This may cause you to get Puppy Fever for National Puppy Day on Saturday. If you do, we have you covered with tips on how best to introduce your dog to the one you already have at home. Plus you can get a free downloadable to help your remember the special day you brought your new pet home. Read on for more. It is the first day of spring on Wednesday, March 20. After a tough winter in much of the nation, many of us are anxiously awaiting spring and the warmer temperatures ahead. Spring means rain instead of snow, outdoors instead of indoors and flowers instead of snowmen. Unfortunately for some, it also means more allergies. The Action for Happiness is a non-profit organization leading a movement of people committed to building a happier and more caring society. What’s interesting about this movement is the worldwide return to focusing on happiness. What makes you happy? According to the site, there are 10 keys to happier living. Check it out and see how you can improve happiness in your life. In the Midwest, where our company is headquartered, many of us love basketball for obvious reasons. 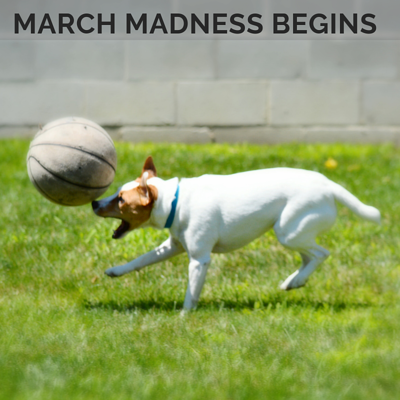 There are so many great things about the first week of the March Madness NCAA & NIT tournaments. Such as all the hope we have for our favorite team, the ability to watch basketball for over 12 hours the first few days and we can dress our dogs up in the appropriate team gear. By April, however, unfortunately many of our teams will be heading home. For now, we’ll focus the hope and anticipation of a potential national championship! Puppy fever has struck on this perfect weekend because Saturday is National Puppy Day! 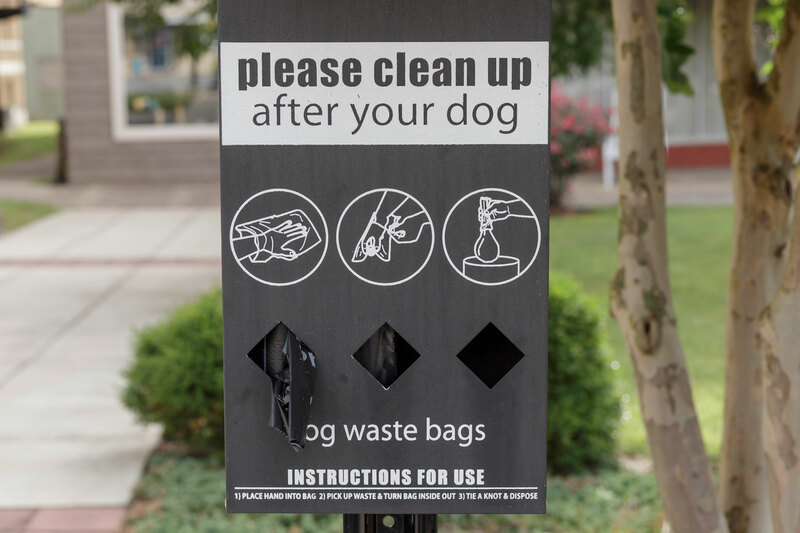 This is your opportunity to find your own puppy and add them to your litter. Use this day as an excuse to add a new puppy to your life. In fact, it doesn’t even need to be a puppy – it could be a senior dog! Studies have shown that people with pets live longer, are happier and healthier. Whether you are bringing a new puppy in the home, or you are adopting a dog, you will want to commemorate the occasion. Most people when a new child is born to the family will start a baby book for them. Here at Parnell Living Science, we believe we should do that for our fur-babies too! Which is why we made this Pet Birth Certificate & Memory Page to use as you bring that new dog into your lives. This is a great way to commemorate the day with a certificate complete with memories you may forget several years from now. Whether you bring home your new dog this Saturday, or did so a while ago, use this FREE downloadable Pet Birth Certificate & Memory Page. Then you will always have something to look back on as they grow through the years. Many people bring a new puppy in their lives when they have an older dog already at home. Is this the case for you? If so, there are a few things you need to think about as you prepare your older dog for the arrival of the puppy. Supervise them when they are together. Do not leave the dogs alone with each other, at least until you are confident they are getting along well. In the beginning, it is recommended to put them in different rooms or crates when leaving the house. If your older dog does not go in a crate, your younger dog can go into his or her own. Or, put them in separate enclosed areas such as the puppy in the laundry room and the older dog in the living room, or whatever you are comfortable with. When they play together and enjoy each other’s company and it is going well, be sure to reward this behavior. As dogs understand the reward system better than any creature, be sure to show them when they are doing co-mingling the correct way. On the flip side, as they are learning about being with each other, it is recommended that neither dog gets punished or put in a time out situation. Rather, correct the behavior using a soothing but firm voice. 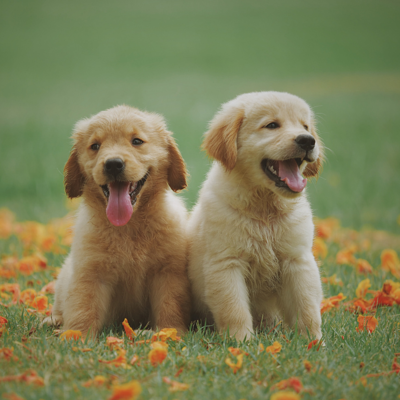 Experts believe going outside for a walk or playing is the best place to establish some sort of familiarity with the dogs as they exchange smells and learn about one another. Remember not to be stressed in any way to tip your hat of your concerns. Your older dog will take it as a cue against the new puppy. Enjoy this time as you want them to enjoy each other! Separate feeding Times and bowls. Each dog should have their own feeding area until they know how to eat at the same time. Often, the best thing to do is to let your older dog outside while your puppy eats. Then switch places with them. As most of us know, older dogs get a little cranky when anyone messes with their food. Get Glyde® Mobility Chews for your older dog. Your older dog is going to need a boost of energy and good health to be around this puppy, which will be a younger version of themselves. Glyde Mobility Chews can bring back the puppy inside by helping joints stay healthy. Glyde is the only joint supplement with three proven key ingredients to relieve the painful signs of arthritis: glucosamine, chondroitin and, of course, the power of New Zealand Green Lipped Mussel (GLM). GLM is what makes us different as it is an all-natural ant-inflammatory, helps improve joint function and is one of nature’s best sources of Omega-3 fatty acids. Now you have all you need to bring home that new adorable fur-baby! Congratulations if you decide to participate in this fun day. After all, who can be in a bad mood with an adorable puppy nearby? 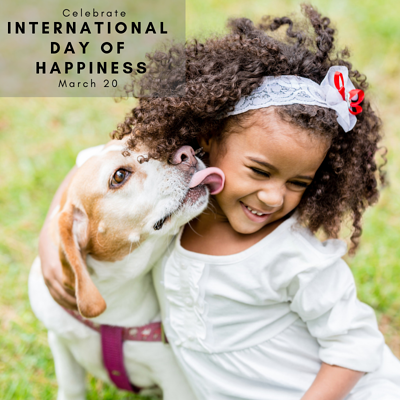 Whether you are bringing one home or enjoying someone else’s dog, enjoy it! Celebrate with a new puppy! 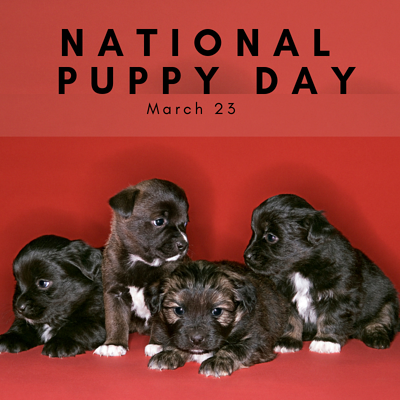 If you are adopting or getting a new puppy elsewhere, be sure to share the puppy love with plenty of pictures and the hashtag #nationalpuppyday. So how can you enjoy all this excitement in one week? How about adopting a new dog and taking them on a walk now that the weather is improving thanks to temperatures. Bonus: you have a friend to watch basketball with! No matter what you do, remember life is meant to be cherished and this just gives you a few reasons why.